WICKER PARK — A dozen homeless people left their encampment under the Kennedy Expressway's North Avenue viaduct on Tuesday morning to allow city workers to conduct a cleanup in an outreach effort organized by Ald. Brian Hopkins (2nd). About half of the group accepted help from social workers and were transported away in vans marked by the city's Dept. of Family and Support Services logo, headed to various agencies for assessment, Hopkins said. But a few stuck around to watch the effort — a collaboration with the Illinois Department of Transportation, Chicago Streets and Sanitation, and the Chicago Police — unfold. Around 10:30 a.m. Tuesday, Dawn Stark was camped out with her belongings on a grassy spot off the Kennedy exit ramp in the 1500 block of West North Avenue while Streets and Sanitation workers hosed down the cement. Stark, 57, said she was glad the workers were cleaning the viaduct where she has lived off and on for six years. A notice of the cleaning was taped to the viaduct wall last Thursday, so "no one was surprised," she said. 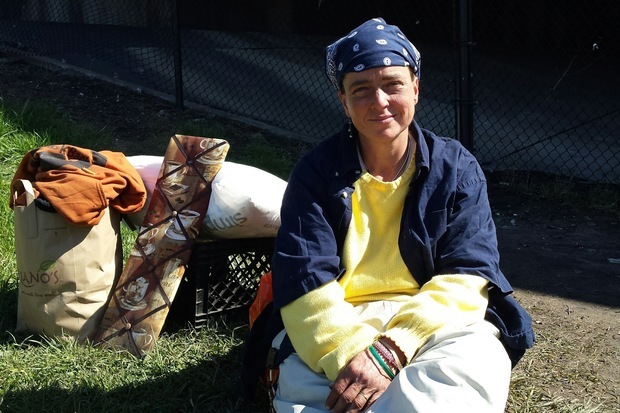 "We don't have to move; they just need to clean it," said Stark, who planned to return to her spot under the expressway after panhandling, usually making around $30 an afternoon, she said. Hopkins acknowledged that most of the homeless like Stark would likely be back in the viaduct after the cleanup. "That's been our experience, they will go back to the viaduct," he said, explaining that the homeless community outreach is ongoing and that it takes time and multiple visits to build trust. Hopkins said Tuesday's cleanup was prompted by one of the people living in the viaduct, a man named Harold, who needs immediate attention for a "medical issue." Citing health privacy laws, Hopkins declined to talk about the medical concerns but said in general the area needed to be cleaned. "There's a lot of food and trash. It's a health hazard and attracts rodents," Hopkins said. Over the past year, Hopkins and workers in the 2nd Ward office have gotten to know many of those living in the viaduct on a first-name basis as efforts to ultimately get them housing continue, the alderman said. Hopkins says he supports the National Alliance to End Homelessness movement "Housing First" that tries to provide shelter first before treating other issues like mental illness and addictions that impact the homeless population. The issue of people living under the Expressway was addressed by Hopkins and five other candidates last year during the race to represent the horseshoe-shaped ward that includes parts of the Gold Coast, Streeterville, Old Town, Lincoln Park, Ukrainian Village, Wicker Park and Noble Square. On the Bosworth Block Club Facebook page, several neighbors heralded Hopkin's efforts and thanked the alderman for trying to clean up the site. Born and raised in Austin, Texas, Stark dropped out of high school her freshman year. She worked as a server in training at Chili's for a while but said she prefers panhandling to a traditional job. "I thought it was the coolest thing when someone handled me dollar. I fell in love with it," she said. The number of folks who take refuge under the North Avenue overpass and panhandle has grown in recent months, according to several neighbors. Leonard Becker has lived in Wicker Park since 2001 and said he "finds the cluster of folks under the ramp disheartening, and in the end very disturbing." "The conditions under the bridge are filthy, unsafe and dangerous for those who live there, for pedestrians, and for motorists. Actually I was not the first in my family to notice; my 11-year-old daughter recognized the conditions and pointed it out to me," Becker said. 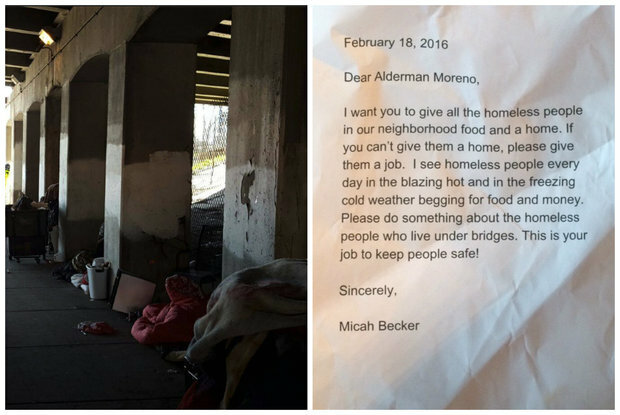 For a classroom project, Becker's daughter, Micah, a fifth-grader, penned a letter to Ald. Joe Moreno (1st) about the issue over the winter. (Micah was not aware that the area, formerly part of the 1st Ward, was mapped into the 'New 2', 2nd ward).